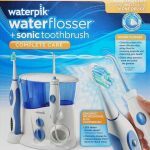 Waterpik WP-900 is a complete care system that combines an individual water flosser and a sonic toothbrush. The combination of water flossing and sonic brushing was about 70% more effective than brushing with a sonic toothbrush alone, and significantly reduces plaque, gingivitis, and gum disease. 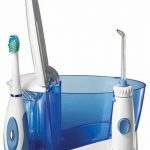 The Sensonic electric toothbrush comes with two heads: One normal and a small one, for the hard-to-reach areas of the mouth. It’s also being shipped with a convenient traveling case. 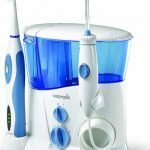 The Waterpik WP-900 Sensonic toothbrush has a built-in timer that signals when the user needs to switch quadrants and a 2-minute timer to signal the end. The brush can be set to two different cleaning modes. The water flosser is a great addition as it can remove close to all plaque in a treated area within 3 seconds! This makes it ideal to clean around braces and implants. 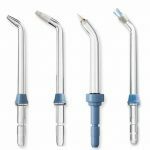 The water flosser comes with 5 flexible tips and the pressure system has 10 different pressure settings. 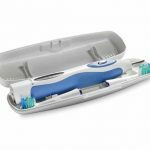 With a large volume water tank enough to last at least 90 seconds and a convenient pause button on the flosser’s handles, you have full control. 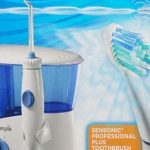 A very decent sonic toothbrush, combined with an excellent water flosser provides for a great complete oral hygiene set. It is a bit large, but it is definitely worth giving a spot in your bathroom. This is great value for your money! Is An Electric Toothbrush Better Than A Manual Brush?